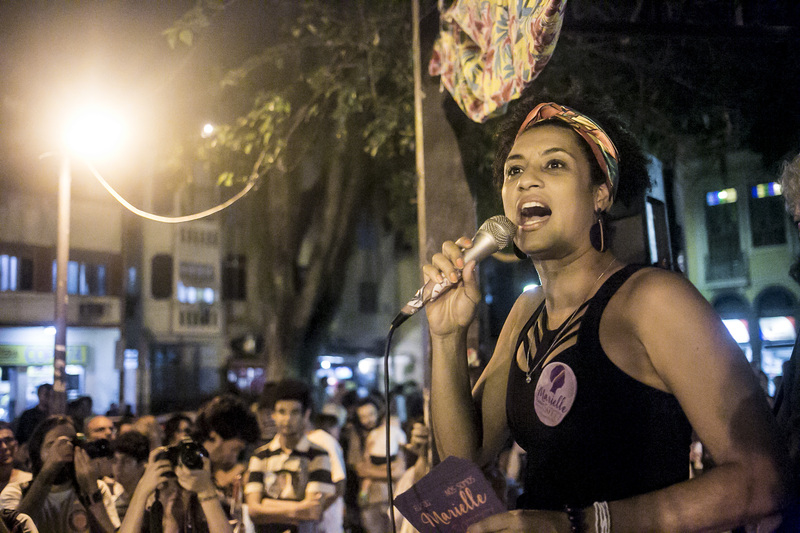 Marielle Franco was gunned down in her white Chevy after giving a speech at Rio’s House of Black Women on March 14th, in what appeared to be an assassination and an attempt to silence what Franco was best known for: speaking out against police brutality on Afro-Brazilians and marginalized people in the favelas in Rio de Janeiro. If those who fired the nine bullets at Franco thought they would silence a movement to address the rampant corruption and racism in Brazil, they were sorely wrong. The next day, tens of thousands of people rushed into the streets across Brazil to protest her murder. Many hoped that her tragic death would shine light on corruption of police officials, violence in the Maré slums between gangs and police and the “federal intervention” of the favelas by President Michel Temer, blaming rising crime as an excuse to put the army in charge of Rio’s state police forces and prisons. Franco was vehemently against the intervention, serving on a council commission to oversee the occupation. Franco was a light of hope for marginalized people residing in Rio’s slums where violence and police intervention is frequent. A resident of the favelas herself, she worked for a scholarship to Rios Pontifical Catholic University, studying social sciences and graduated with a master’s degree in public administration. She became militant after a stray bullet during a shootout between police and gang members killed her friend in 2005. While Brazil touts being post-racial, believing a black/white divide is expressly imported from America and never happened in the country, critics claim the myth silences all conversations concerning discrimination and violence. Every day, 112 Black or mixed-race Brazilians are killed. Making up 54% of the national population, Black and mixed-race Brazilians account for 71% of all homicides. From 2005-2015, the proportion of Black and mixed-race Brazilians killed rose by 18% while the figure for whites dropped by 12%. Meanwhile, white politicians in power are attempting to divert the cause of Franco’s death away from discussing race. “Her bloodshed can’t be used as an opportune moment to talk about hate. When you talk about a black-white divide, you are contributing to this division,” announced white national senator from Rio Grande do Sul state, Ana Amélia. In 2017, 1,124 people were killed at the hands of the police; 80% of those killed were Black or mixed-race. Franco denounced police killings of Black favela residences, with special criticism for Rio’s 41st Military Police Battalion, known as “the death brigade” for killing and shooting Black youth. Franco’s last tweet condemned the death of Matheus Melo, a young Black favela resident who was shot coming out of a church with his girlfriend, “How many more people need to die before this war ends?” He was only one of the latest victims in a conflict between drug traffickers, militias and police in Rio state. Franco’s killers have not been caught. Federal prosecutors in Rio believe the evidence points to corrupt police officers. The bullets came from police ammunition stocks, and the location of her murder seems to have been meticulously chosen, since her killers followed her from the meeting and chose a “blind spot” where street cameras were not functioning. How many more people need to die before this war ends? Yet again, women gather outside prison gates to find out if their loved ones are still alive. This time, it’s Pedrinhas Prison, in the state of Maranhão, in the northeast of Brazil. On Tuesday, a local news outlet broadcast a video, delivered by Sindspem, a prison workers’ union, showing the decapitated bodies of three prisoners in Pedrinhas. Local, national, and international agencies yet again decried the situation in Brazil’s prison system, and in particular at Pedrinhas. 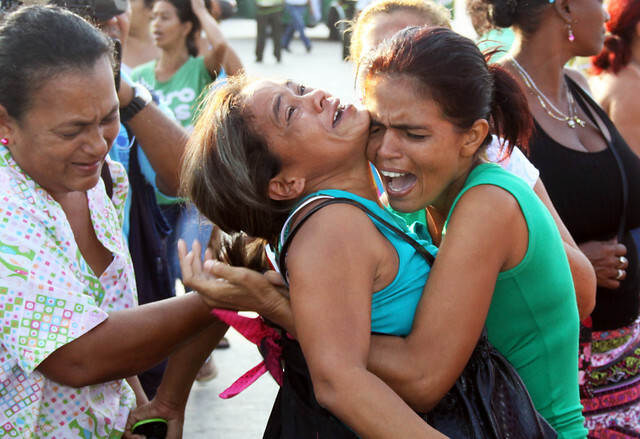 In 2013, 60 or more prisoners were killed in Maranhão prisons. Maranhão is bad, and Pedrinhas is bad. But Pedrinhas is not the worst. The worst is that it’s typical. Pedrinhas is designed to hold 1700 prisoners. It currently houses 2500. By Brazilian standards, that’s not so bad. The entire system is supposed to hold no more than 3,300 prisoners, and actually holds 6,200. Pedrinhas may be intolerably overcrowded, but, by Brazilian standards, it’s not so bad. Maranhão is a particular case. The Brazilian `economic miracle’ hasn’t quite reached the northeast state. Of Brazil’s 27 states, Maranhão has the second-worst Human Development Index. Its per capita income is Brazil’s lowest in Brazil. Where Brazil’s national illiteracy rate is just below 9 percent. Maranhão’s is over 20 percent. One family, the Sarneys, have ruled the state for almost fifty years. Not surprisingly, the Sarneys claim the press is being sensationalist, the report is the work of disgruntled employees, and the overcrowding is a result of slow courts. In that last claim, the Sarneys are not altogether wrong. Where Maranhão is an outlier State, Pedrinhas is just one of the gang. Brazil boasts the world’s fourth largest prison population. In the past twenty years, the prison population has increased 380 percent, while the national population has only gone up by 30 percent. From 2000 to 2012, the number of prisoners awaiting trial skyrocketed from just below 81,000 to close to 200,000, an increase of 250% in 12 years. HIV prevalence among prisoners in Brazil is one of the highest in the world. And for women? The incarceration of women has kept pace with the national trend, which is to say it’s risen quickly over the last twenty years. Women’s prisons are overcrowded. Women prisoners have high rates of HIV. Half of women prisoners are young (18 to 29 years old). Two-thirds are categorized as Black or Mixed race, and two-thirds of women prisoners are in for “drug trafficking”. And what’s the proposed solution to the twenty-year surge in incarceration that has criminally overcrowded prisons, by criminalizing and then militarizing urban poor and working-class populations? Privatization! In this season of mass protests and demonstrations, much of the news media has decided that this global phenomenon is an expression of `middle-class rage’. It’s not. The waves of mass protests are a creative response to the form of urbanization that now covers the globe. Remember, already more than half the world population lives in urban zones, and, according to the United Nations, soon more than half the world population will live in urban slums. This means the urban local is global. That’s the lesson that protesters, and in particular women protesters, are once again bringing to the streets and beyond. The march of protests is a global urban uprising. Ask the women, and their colleagues and friends, who, through policy brutality, have become icons of the protest movements. How does protecting a park equal defending rights equal defending democracy? On one hand, in the specifics of the moment, the equation is part of the pro-democracy rhetoric. On the other, more pertinent hand, Ceyda Sungur is an urban planner. When Sungur says, “For me this is about freedom of speech and the power of the people”, she means the struggle for the park, rights, democracy, freedom, power, is an urban struggle, a struggle against authoritarian, anti-human, anti-woman urban development. Then there’s Liv Nicolsky Lagerblad de Oliveira. She lives in Rio. One night, she was standing alone on a street corner where there had been demonstrations earlier. Hours earlier, the riot police had forcefully removed all the protesters, but they were still hungry. They descended upon Oliveira, alone, late at night, just standing, and pepper sprayed her full in the face at close range. Yet again, the riot police created a new icon, yet again a woman. Around the world, thanks to `urban development’, the working poor can’t afford to live in the slums. Women know this story, because they’re the central, disallowed subjects. Repeatedly, protestors argue the City has become the epicenter of debt-and-death. Worldwide women are protesting the designed hostility of `the new Jerusalem’ to women and girls. Women, like Ellen Woodsworth, the founder of Women Transforming Cities, are organizing with women to address the complete and systemic lack of gender equity lens that marks city planning and governance. Urban public lighting, transportation, access to medical care, access to police, affordable housing, green common spaces, toilets, living wages, decent working conditions, violence, crime, peace, well being, inequality, equality are all particular to women and are all feminist issues. For example, in Japan, the environmental recycling movement had to rethink everything when women challenged the assumptions of their mandated unpaid, unrecognized, `informal’ labor … in the name of a green economy. The women in Japan said, “No gender equity, no peace.” The women in Istanbul, Ankara, Dhaka, Rio, São Paolo, Vancouver, Cape Town, Barcelona, Buenos Aires, and beyond, are saying so as well. The last green space in Istanbul is an urban women’s issue, and a feminist crisis. The rise in public transport fares and the pricing of slums out of the reach of the working poor in Rio de Janeiro is an urban women’s issue, and a feminist crisis. Thais Gomes, Brazilian `shantytown dweller’, understands that. It’s not “middle class rage”. It’s urban. Around the world, women are saying “Hell no!” to the “gift” of global hyper-urbanization and “Hell yes!” to cities that respect all living beings as valuable, to city administrators and planners who see value in the social, to those who value women as humans, neighbors, partners. When the Greek state tried to close the ERT television station, workers, women like Maria Kodaxi, refused to move. 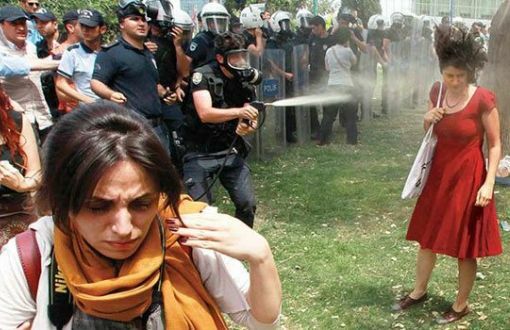 Across Turkey, women refused to accept the violence of the State and, one by one and then in tens and hundreds, became “duran kadin”, standing women. In Greece and Turkey, the struggle continues. As Turkey gave the world Gezi Park and #durankadin, Brazil this week gave the world … vinegar. Vinegar uprising. Vinegar revolt. The salad revolution. Police thought they’d quell and dispel a relatively small group of protesters with tear gas, batons, and violence. Instead of quell, they got rebel. Where there were tens, a million marched and more are on the move. And vinegar became the symbol of resistance and solidarity. It’s a good week for new symbols that match new forms of action. Carla Dauden is one Brazilian woman engaged in protest, and she is not going to the World Cup. Dauden is a young filmmaker, a native of Sao Paolo, and the director, producer, narrator and face of “No, I’m not going to the World Cup.” Part of her reason is an ethical calculus: “Now tell me, in a county where illiteracy can reach 21%, that ranks 85th in the Human Development Index, where 13 million people are underfed every day and many people die waiting for medical treatment, does that country need more stadiums?” As of this writing, over 2.5 million people have watched and listened, and maybe heard, Carla Dauden explain why she is saying, “No”. Ealier this week, the Inter-American Commission on Human Rights tried to create a space for the indigenous communities, and their supporters, and the Brazilian government to enter into dialogue. 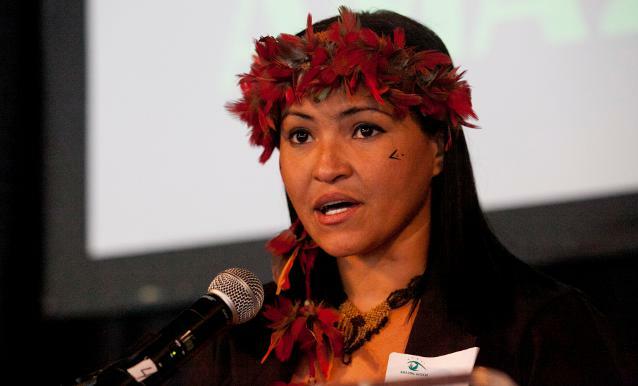 The Juruna people sent their leader, Sheyla Juruna, who travelled days to get to Washington. The much wealthier, much more popular, and much better resourced Brazilian government sent … no one. And so indigenous communities of the Xingu, and their supporters, took to the dam site, and they were, and are, led by women. Sheyla Juruna. Juma Xipaia. Roberta Amanajás. Antonia Melo. Some, like Juruna and Xiapaia, are indigenous leaders. Some, like Amanajás, are human rights advocates and activists. Some, like Melo, are leaders of movements, in this instance the Xingu Forever Alive Movement. The indigenous women leaders and communities of the Xingu River basin know, and live, this history today. They know the genocide takes many forms. Sometimes it’s flat out extermination campaigns. At other times, it’s removal, person by person, nation by nation, child by child. In the United States, for example, a Federal law states that if Native American children are taken from their homes, they must be placed with their family members, relatives, their tribes or other Native Americans. And native children are taken from their homes, at a much higher rate than children of other races and communities. Some studies suggest the rate is twice as high. Furthermore, of the native children taken from their homes, a remarkably low percentage have experienced sexual or physical abuse. So, why are they taken? “For their own good” … of course. A report this week highlighted the situation of these stolen children in South Dakota. Nearly 90 percent are placed in non-Native households or group settings. Those non-native group settings are private, and making good profit off of the “poor” native children. Who cares? Well, the children care. Their families care. Their communities care. And while the caring of the children isn’t particularly gendered, the caring by the adults is. Women. Women like Janice Howe, a grandmother who refused to let the State get away with kidnapping, who fought for over a year and a half to get her grandkids back. Four children, including Antoinette, 6 years old, and Raushana, 5 years old. When they returned, 18 months later, they were each a full dress size smaller. Only now are the stories of their sojourn beginning to emerge. There are native Grandmothers’ Groups, native foster home providers, native foster parents, tribal social workers, and they are everywhere on the reservation. There are also mothers who mourn and wait and, if they’re very “lucky”, may, just may some day meet their children. In the case of Dwayne Stenstrom, kidnapped by the State at the age of 8 years old, this reunion occurred decades later … six months before his mother died of cancer. And no one ever receives an apology, ever receives an acknowledgment. This is what military occupation looks like. As the Occupy Wall Street movement has spread, or effloresced, across the United States and Canada, indigenous people across both countries have criticized the term “occupation”. Some have suggested replacing it with “decolonize” or “(un)occupy”, others have noted the painful nationalism and racism of their supposed, or potential, allies in the current movement. And others have said, instead, “Defend Mother Earth.” At the Belo Monte Dam site yesterday, Juma Xipaia explained, “We will not be silent. We will shout out loud and we will do it now.” The Mothers, Grandmothers, Daughters, Sisters, Aunts, Women are gathering, out loud, now, to Defend Mother Earth. Another occupation is possible. Shout out loud, do it now.